Average housing prices in East and South Bangalore posted a positive growth of two percent, each, in Jul-Sep 2016, as compared to the preceding quarter. South Bangalore’s Arekere held the baton of progressive capital charts with a massive surge of nine percent, QoQ. Apartment values in this pocket benefitted from being situated in proximity to the IT/ITeS hub of Bannerghatta, and being competitively priced as compared to this benchmark location. Proposed metro connectivity between KR Puram and Silk Board buoyed sentiments in both the micro-markets, leading to a quarterly spike of 5-8 percent, each. Sarjapur Road in East and Bannerghatta and Koramangala in South, each, reported a capital rise of seven percent, owing to the enhancements in road infrastructure. 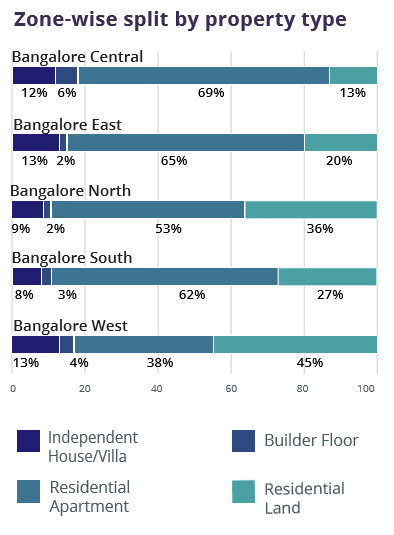 Almost 75 percent of the tracked localities in Bangalore clocked an uptrend in capital values of land parcels. The average weighted price of plots rose by three percent, QoQ. The rising land values can be attributed partially to infrastructural improvements. The primary reason lies in an increase in ‘ask’ rates by ambitious landowners, who intend to leverage the upbeat market. Hessarghatta in the South emerged as the frontrunner with 12 percent capital growth despite numerous glitches in its civic infrastructure. The locality exemplifies artificial price hike. Magadi Road, which enjoys good connectivity via Nice Road, ORR and metro, witnessed prices increasing by four percent, QoQ. Rental growth of residential apartments in the Silicon Valley of India matched pace with the city’s capital landscape, reporting an upward price movement of four percent in Jul-Sep 2016, as compared to the corresponding quarter in 2015. Over 70 percent of the tracked localities recorded an annual increase in rents, testifying an upbeat market. 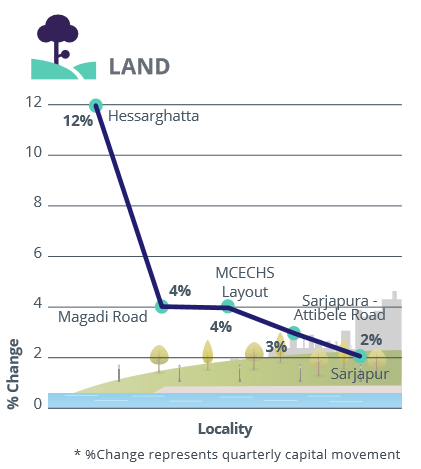 Being a favourite among the working populace for offering easy connectivity to the IT hubs of Whitefield, Marathahalli and Electronic City, the rental graph of Sarjapur Road and Haralur Road buoyed by 12 percent, each, YoY. The posh address of Indira Nagar in East Bangalore witnessed median rental rates escalating by 11 percent over the last one year. The locality owes its popularity to the burgeoning start-ups and numerous entertainment zones in the vicinity. While average weighted rentals of builder floors increased by three percent in Jul-Sep 2016, vis-à-vis the September ending quarter in 2015, TC Palaya clocked a growth of nine percent, YoY, on the back of comparative affordability and infrastructure overhauls in the pipeline. Improved connectivity via metro, rental demand from workforce in Electronic City and proximity to other premium locations such as BTM Layout, put Hulimavu on a path of unceasing growth. 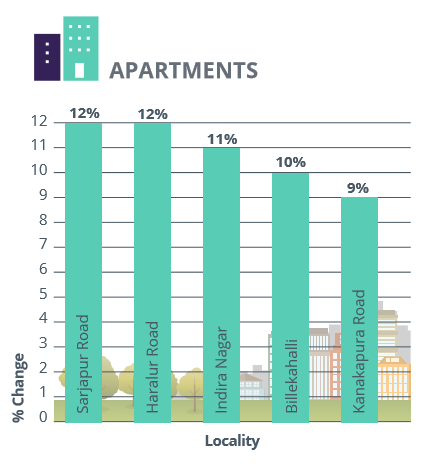 Rental values in this locality, scaled up by seven percent, annually. KR Puram and Kumaraswami Layout registered an upswing of four percent each on the rental charts. 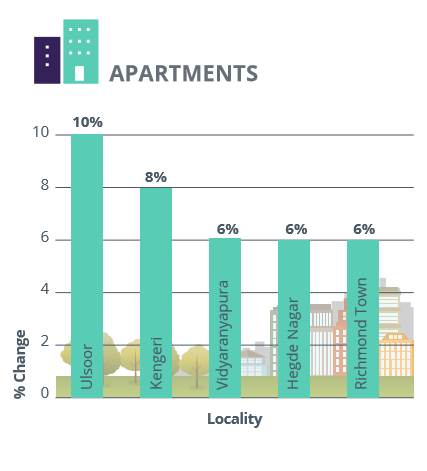 Despite battling with civic infrastructure issues, rents in these two localities grew on the back of enhanced connectivity and proximity to leading residential belts. Echoing the vibrant real estate story of Bangalore, capital price tags in the North, West and Central zones, too, moved up. The average values of residential apartments surged by two percent in Jul-Sep 2016, as compared to Apr-Jun 2016. Decongestion facilitated by Namma Metro Phase I set the backdrop for Ulsoor’s growth story since the quarter ending March 2016. The locality headed the top performers’ chart in Jul-Sep 2016 with a quarterly rise of 10 percent. Capital values in Kengeri increased to the tune of eight percent, QoQ, as a result of the East-West metro connectivity. The locale is expected to witness more growth in the forthcoming quarters. The capital growth trajectory of residential plots in the zones ran parallel to that of apartments, thereby, observing a quarterly rise of two percent in the September ending quarter of 2016. 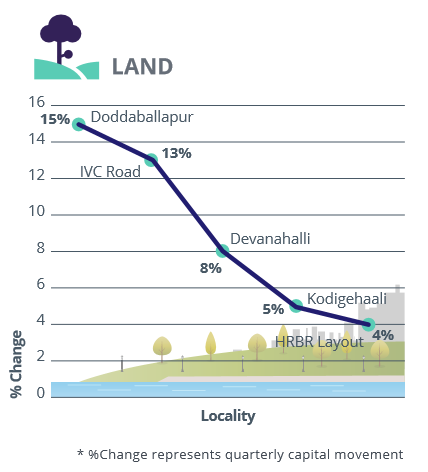 Affordable housing projects and improved connectivity bolstered prices of land parcels in Doddaballapur, leading to an upsurge of 15 percent, QoQ. The micro-markets of IVC Road and Devanahalli reported a rise of 13 percent and eight percent, respectively, owing to the localities’ proximity to the International Airport. The proposed Information Technology Investment Region (ITIR) and Special Economic Zones (SEZs) have contributed to the escalation in capital rates. The zones delineated a mounting rental graph of four percent, YoY. This growth can be attributed to the heightened connectivity facilitated by the East-West metro corridor and the expanding base of IT/ITeS companies, thereby translating into proliferation of residential and commercial activity in the zone. Riding the wave of enhanced social and road infrastructure, Yeshwanthpur and Thanisandra recorded an upward rental movement of 12 percent in Jul-Sep 2016, vis-à-vis Jul-Sep 2015. Proximity to Manyata Tech Park also supported the rental market of Thanisandra. The possibility of road upgradation, proximity to the airport and smooth connectivity via the ORR, drove Hennur Road’s rental market by 10 percent, YoY. 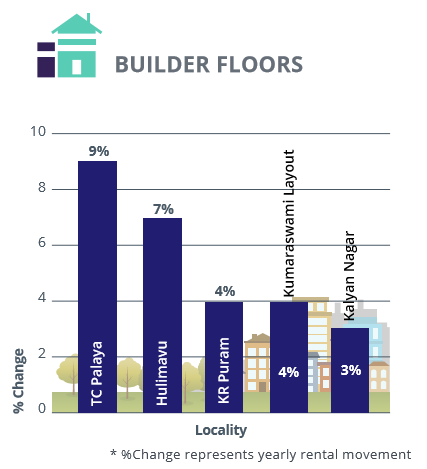 Emulating the overall rental trend of Bangalore, rents of builder floors, too, grew by a margin of four percent, yearly. The northern zone performed better than the West, with nearly 85 percent of the residential pockets posting growth, as opposed to 70 percent in the western belt during the Jul-Sep 2016 quarter. The Gottigere–Nagawara metro line, which smoothened connectivity to CBD and South Bangalore, propelled rentals of Nagawara by nine percent in the Jul-Sep 2016, as compared to the corresponding quarter in 2015. 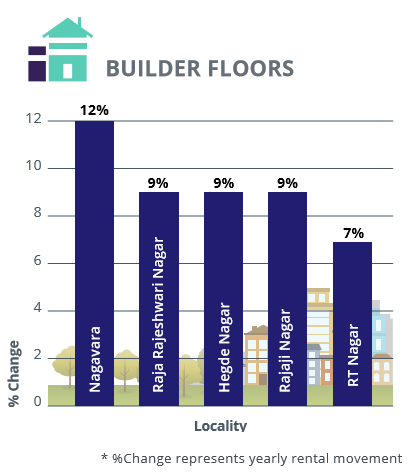 Raja Rajeshwari Nagar, Hegde Nagar and Rajaji Nagar, each, witnessed an annual spike of nine percent, while rents in RT Nagar, Vijayanagar and Sahakara Nagar improved by seven percent. 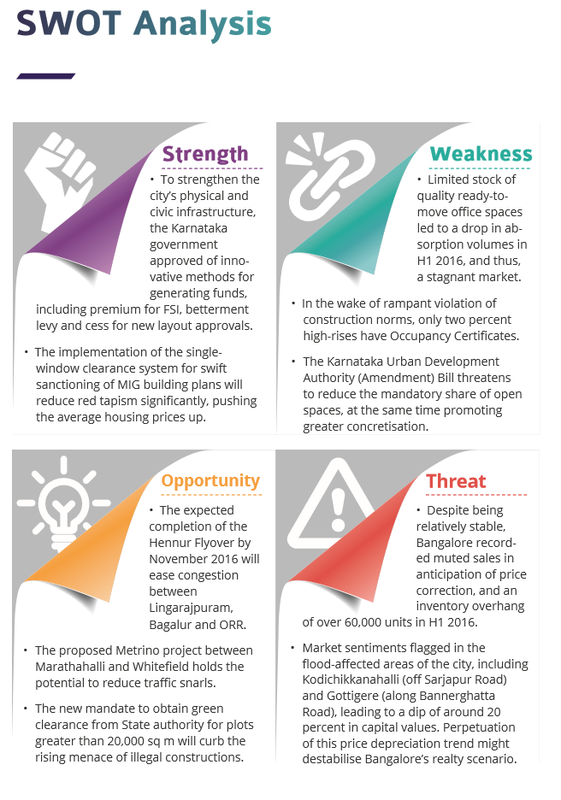 Riding the wave of an upbeat office market, healthy availability of land parcels, and relatively less bureaucratic hurdles, Bangalore’s real estate landscape seems to be on the cusp of recovery. The city witnessed a decent surge in new launches as well as property transactions, indicating an improvement in buyer confidence. Residential apartments captured almost 60 percent of the city’s realty, reporting maximum concentration of this property type in East and South Bangalore. The presence of piled-up inventory is evident in the demand-supply gap of apartments. However, demand for this format has increased while the supply has reduced in Jul-Sep 2016 vis-à-vis Apr-Jun 2016, thereby, exhibiting a trend towards bridging of the fissure. The popularity of independent houses/ villas and builder floors far exceeded its availability, while supply of residential plots surpassed demand for the same. The preference for affordable properties priced within Rs 40 lakh continues unabated in Bangalore. However, the shortfall in supply indicates the developer fraternity’s inability to cater to the rise in demand for this budget bracket. Although mid-income housing (Rs 40-60 lakh) is the second most-favoured budget category, properties in the high-income bracket (Rs 60 lakh- Rs 1 crore) recorded maximum availability. The luxury and ultra-luxury segments with homes priced Rs 1 crore and above, together captured only one-tenth of the entire market. These two budget brackets recorded a demand-supply equilibrium. 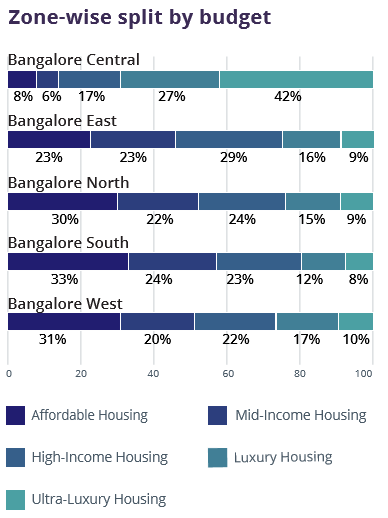 Most of the affordable and mid-housing segment projects were concentrated in South Bangalore, while the eastern zone boasted of the highest number of high-income and premium properties. The nuclear family trend ensures that 2BHK units continue to remain the most popular configuration in Bangalore. The demand-supply equation in this format is in perfect congruence. 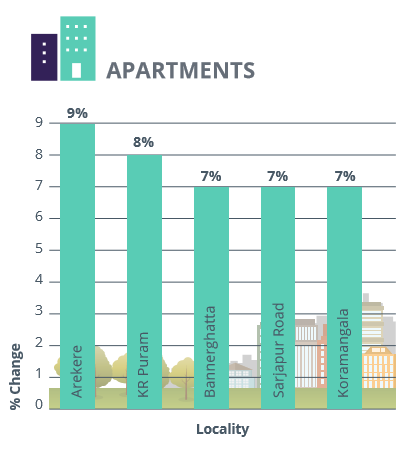 Although 3BHK units emerged as the second favourite segment in Bangalore, popularity of this configuration surprisingly dipped by nine percent in Jul-Sep 2016. Restricted buyer pockets could be one of the reasons driving this trend. Demand for 3BHK homes spilled over to 1BHK units, which witnessed a surge from four percent in Apr-Jun 2016 to 17 percent in Jul-Sep 2016. Improbability of any price correction might have led buyers to settle for smaller units. The demand-supply equation of properties configured as 4BHK continues to remain almost same, QoQ. Demand for this configuration saw a slight dip in Jul-Sep 2016 vis-à-vis Apr-Jun 2016. Demand for ready-to-move-in properties in Bangalore inched up slightly in Jul-Sep 2016, as compared to Apr-Jun 2016. Although supply of ready-to-move properties rose by three percent, QoQ, the availability of such units was not able to match pace with its growing demand. Central and South Bangalore housed 85 percent of the total ready inventory of the city. This was followed by the North zone, which housed almost 80 percent completed projects. 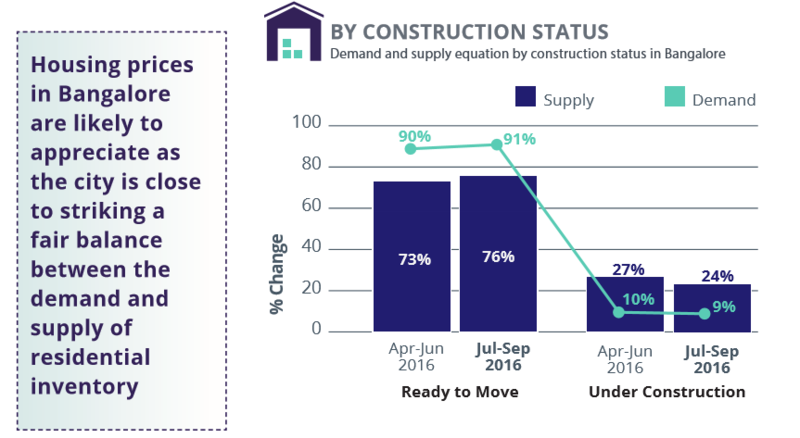 The buyer base in the city has been circumventing under-construction homes, which is proven by the shrinking demand for houses in this category.